Below you may find some very interesting facts about Greece. More than 16 million tourists visit Greece each year. Compare this with the country’s entire population, which is approximately 11 million. Tourism is one of the largest industries in Greece, contributing to the Gross Domestic Product by about 16 per cent. Voting is mandatory for every citizen over 18 years old; one cannot choose not to vote. It is also mandatory for Greek men to serve in the army for some time, when they reach 18 years of age. This period used to be over two years long, but is now nine to twelve months. Greece is the third largest producer of olives. Olive trees have been cultivated here since antiquity. According to mythology, Athena and Poseidon competed for who would become the patron of Athens; so, they decided they would each offer a gift to the citizens, who would then choose one to be the most valuable. Poseidon offered the gift of water, but Athena, offering the gift of an olive tree, became the patron of the city, which was also named after her. Greece also has over 7 per cent of the world’s marble production, while it is the leading producer of sea sponges. Thousands of English words derive from the Greek language, such as “academy”, “plethora”, “marathon”, “alphabet”, “apology”. Nearly 80% of Greece is mountainous, which makes all Greek rivers non – navigable. 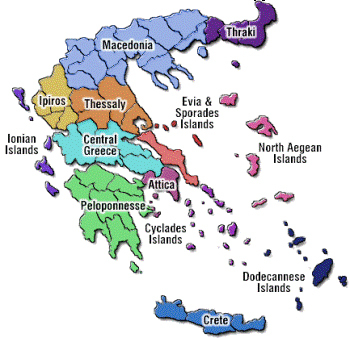 There are over 2,000 islands in Greece, but only circa 170 are populated. The largest island of Greece is Crete, followed by Evia. Over 40% of the Greek population lives in the capital, Athens. Athens is over 7,000 years old, rendering it one of the oldest cities in Europe. It is also the birthplace of democracy, Western philosophy and literature, historiography, tragedy and comedy. Greece has more than 250 days of sunshine annually. Until the late 1990s, Greece and Turkey had seen their relations deteriorate, mainly because of territorial disputes. However, a catastrophic earthquake that hit both countries in 1999 helped in the vast improvement of their relations. The life expectancy of Greek women is 82 years and of men is 77 years. It is ranked 26th in the world for life expectancy rates. Feta is the national cheese of Greece, made from goat milk since the Homeric times. Greece has the highest consumption rate of feta per capita in the world. The first Olympic Games took place in Ancient Olympia in 776 BC. The most popular destination for tourists in Greece is the city of Rhodes, famous for once housing one of the Seven Wonders of the Ancient World, the Colossus. Greek has been spoken for over 3,000 years, making it one of the oldest languages in the world. No point in Greece is more than 137 kilometers away from water. The country enjoys the 10th longest coastline in the world, about 15,000 kilometers. The word “barbarian” is Greek, meaning people who don’t speak Greek and therefore sound like saying “bar – bar – bar”.